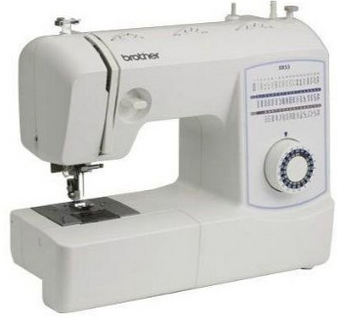 Brother XR53 is a good quality, entry level mechanical sewing machine. It has a good variety of stitches, but it is overpriced in my honest opinion. XR53 is an entry level mechanical sewing machine from Brother. This is one machine that didn’t make a mark in people’s mind, mainly because of its pricing. It is priced very close to Brother CS6000i, which is the best selling sewing machine in the under $200 price category. That was a terrible mistake and XR53 never managed to pick itself up from the blow. I hope it will be better priced for the shopping season at least. Now let us focus on what Brother XR53 offers to a beginner sewer. The machine features 53 built-in stitches including a 1-step buttonhole (cheers to Brother for including an easy to use 1-step buttonhole instead of 4-step one). It has an easy to use top drop-in bobbin, you just need to drop the bobbin in rather than putting up with the hassle of removing the side cover. The clear cover lets you keep an eye on the thread supply. It is equipped with an automatic needle threader to thread the needle (it saves eye strain quite a bit). Brother XR53 is very lightweight, it weighs just 12.6 pounds. A built-in carry handle is provided so that you can easily carry it, especially if you are attending sewing classes. For sewing cuffs and sleeves, you can convert the machine to free arm. An LED bulb illuminates the work space. There is a built-in accessory storage compartment. Stitch selection on Brother XR53 is done by turning a dial. Thread tension is also controlled using a dial. The reverse stitch lever is of reasonable size and is conveniently located. The machine comes with 25 year limited warranty. Brother XR53 is a user-friendly machine, no question about it. All the controls and adjustments are easy to figure out, there is nothing like the so called ‘learning curve’ with this machine. You can start sewing straightaway. The buttonhole maker makes excellent buttonholes. The automatic needle threader works as expected (some Brother machines do have tricky needle threaders that require couple of attempts, not XR53). The operation is quite and smooth. The stitch quality is consistent across different types of fabrics. Its performance with denim is quite good. The variety of stitch options is also very good. The only thing that worries me is the price. The pricing is right in the face of Brother CS6000i which is far more superior in features and performance. Some may argue that both are two different types of machines. Brother XR53 is a mechanical sewing machine whereas CS6000i is a computerized one. Even then, the price is not justifiable because CS6000i is that good a machine, which is why it features in our list of “Machines You Can Buy With Your Eyes Shut”. I hope the price will come down in the future.